(male narrator) George Huber knows money doesn't grow on trees, but ask him where gasoline comes from and he won't just tell you, he'll show you. To understand, you have to go with George to the local lumber yard in Amherst, Massachusetts. Here he is looking for cellulose, the building block in plant cells. It gives plants their structure. Nature has made this material to be very strong. That's why we build houses from materials that are made of cellulose. (narrator) George finds the cellulose he needs for our demonstration in this pile of wood chips. In this wood is stored energy. According to George, lots of it. 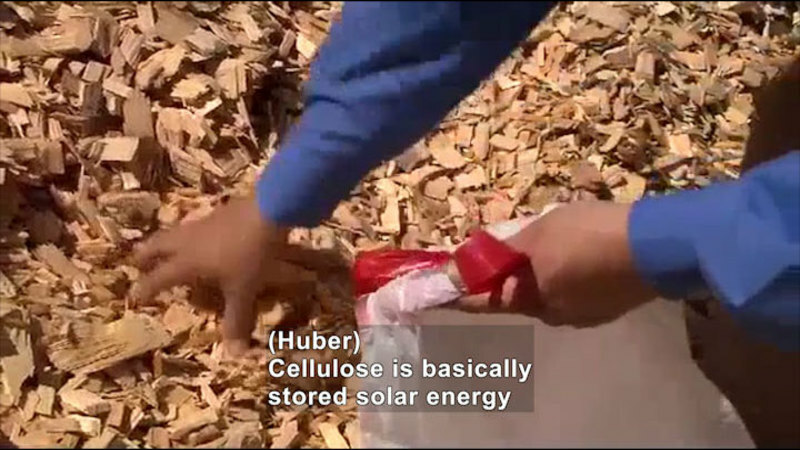 (Huber) Cellulose is basically stored solar energy that's found in all plant material. (narrator) George, with help from the National Science Foundation, is working to unlock the sun's energy that's stored in cellulose, which is the most common organic compound on earth. (Huber) Look at its abundance. We have enough biomass in the U.S. that has the energy content of 60% of the petroleum we use. It's both cheap and abundant. (narrator) As oil becomes less cheap and less abundant, our dependence on it poses dangers, not only to our national security, but to our environmental security as well. Finding an alternative to oil is critical. Which brings us back to George and those wood chips. He's taking them to a lab at University of Massachusetts. It's here that George and a team of researchers makes gasoline from wood. Here we have some sawdust that we got from Cowls Lumber. This is our feed to make green gasoline. Our first step is to put this in the hopper. Just pour some sawdust into the hopper. Our hopper--there's a screw in here that turns around and injects the sawdust into this reactor. In this reactor is where the sawdust-- this reactor is very hot-- This reactor is where the sawdust is converted into green gasoline. (narrator) Inside, the reactor looks something like this model. Superheated, vaporized wood interacts with a catalyst, a chemical powder George has created. As the vapor passes through the powder, it turns into a gaseous steam with the chemical properties of gasoline. (Huber) Leaving the reactor is a gaseous stream containing green gasoline. A series of these condensers collects our product. If we look in one of our condensers we'll see our product that we're making. Here is our product-- green gasoline. (narrator) Green indeed. The production and use of this green gasoline leaves a zero carbon footprint. The CO2 our engines release comes from the plants used to make the fuel. The CO2 is recycled to the plant when the plant regrows. The beauty of green gasoline is you don't need to change the existing infrastructure. We're gonna make the same gasoline from biomass that you make from petroleum. We can make gasoline, diesel fuel, home heating oil, jet fuel, and chemicals. Anything made from crude oil, in 10 to 20 years, will be made from biomass. (narrator) That could also include biomass that often ends up in landfills, like plant stems, bark, waste wood, even discarded paper. (Huber) In the future, you'll see switch grass farms. Or you'll see farms that grow the corn-- you convert the corn kernels for food and then the stalks you convert to biofuels. (narrator) So far, George has created biofuels in lab-scale quantities, a few ounces at a time. We need all those materials characterized. (narrator) He's working on creating biofuels on a larger scale, a few tons daily. That, he hopes, will eventually lead to full-scale commercial production. (Huber) They're gonna put green gas in their car and they won't even know. The changes will be made at the biorefinery. Rather than crude oil, we'll be refining biomass. For Science Nation, I'm Bruce Burkhardt. Like everyone else, George Huber knows money doesn't grow on trees. But, ask him where gasoline comes from and he won't just tell you, he'll show you. To fully understand, Science Nation recently went with Huber to a local lumber yard in Amherst, Mass. A lumber yard is the perfect place to find cellulose, the key building block in plant cells and the organic material that gives plants their structure. So what does cellulose have to do with gasoline? A lot.